Bishopswood Field is a sports field run by Rotherfield United Football Club. It is a large area with several football pitches and a car park and children of several different ages play here. The southern area gently slopes downwards to a skate park at the bottom. It also houses the Green Gym Tool Shed. The boundaries are mainly hedges and trees with gates in various places. Access is through two locked gates, the first giving vehicular access to the car park only. 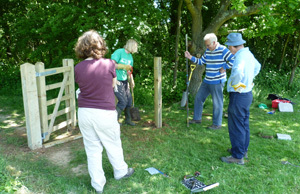 The Green Gym normally visits once a quarter to help maintain the boundaries. This has involved installing fencing and gates, cutting down and burning scrub. This is the only work for which we make no charge in return for our tool shed being housed here. We meet in the car park and obtain tools as required directly form the tool shed.